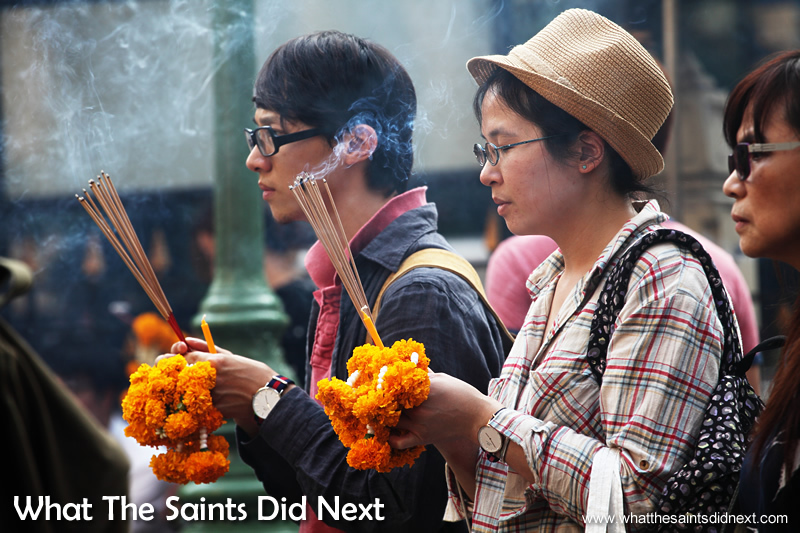 Worshippers burn incense as they offer prayers at the Erawan Shrine in Bangkok. ‘Bangkok Bombing’ was the headline across the TV; we watched horrified as CCTV footage of the explosion at the Erawan Shrine was replayed over and over and innocent people ran for their lives. 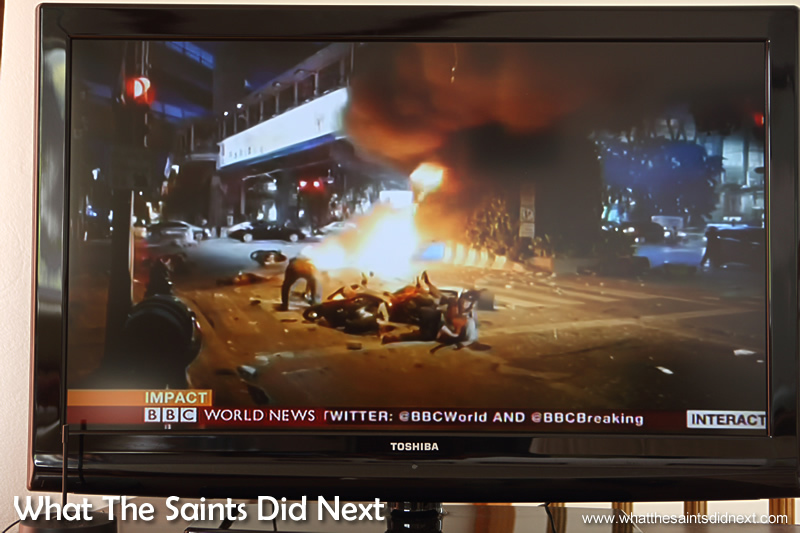 BBC World News TV coverage of the Erawan Shrine bombing in Bangkok. Later as the television cameras identified the location where the bomb had detonated, I realised we had been sitting in that very spot just a few short months ago. We had first been standing outside the railings, uncertain of correct protocol at the religious site, when a smiling Thai woman beckoned me forward saying it was ok to take pictures. We spent about half an hour at the shrine. Although we photographed the scene we mostly just sat and watched the constant flow of Asian people burning incense sticks, laying garlands of marigolds and offering prayers to the Buddha, Phra Phrom. I was struck by the large volume of young people present; back home and in the UK I know, church going age was generally older and numbers in decline. Candles being lit at the Erawan Shrine in central Bangkok. 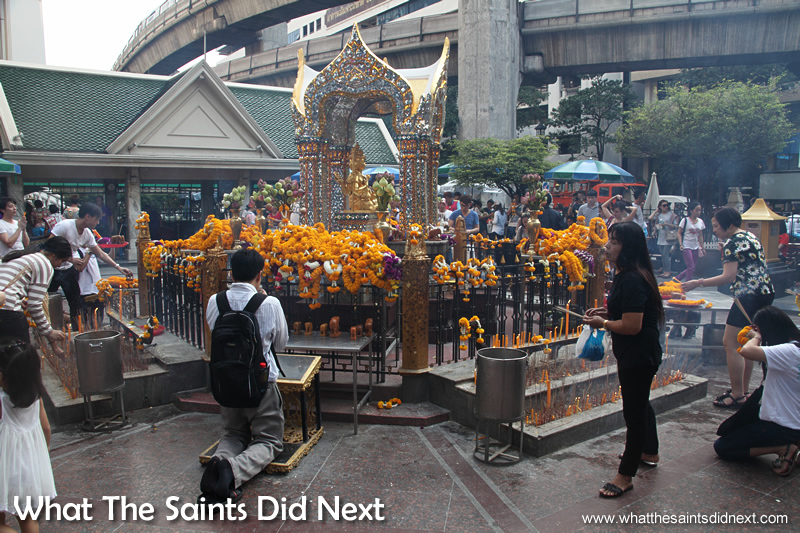 The Erawan Shrine is located next to the Grand Hyatt Erawan Hotel, at the Ratchaprasong intersection of Ratchadamri Road in Pathum Wan district. It is overlooked by the Bangkok Skytrain’s Chitlom Station. There are also many shopping malls nearby. 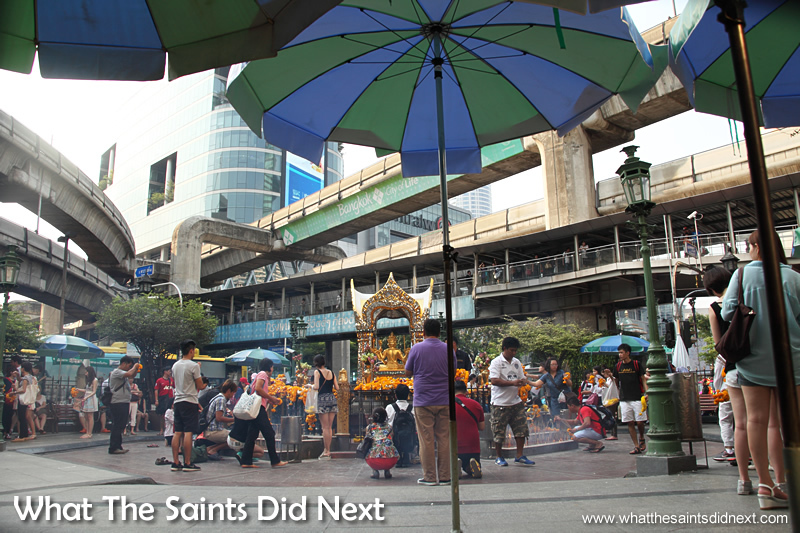 The Erawan Shrine is a very popular attraction for local worshippers, but also tourists. It was our first full day in Thailand. We basically hopped on the city’s train system, the BTS, and jumped off at a random, central stop in the city to go exploring; that was the extent of our planning. We later stumbled across the Erawan Shrine, which gives an indication of how central it was and why the bomb caused so many fatalities and casualties. 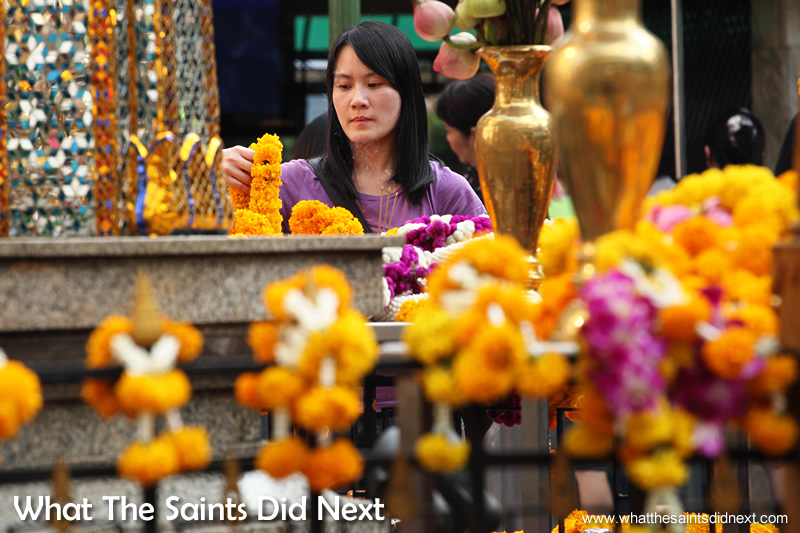 Plenty of colour is brought to the Erawan Shrine by the garlands of orange marigold flowers that are laid around the railings. 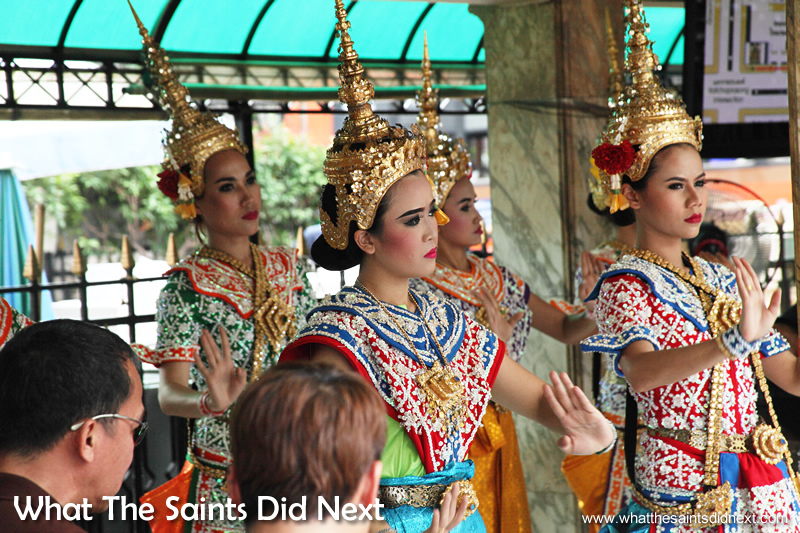 Thai dancers at the Erawan Shrine performing traditional dances. Carefully applying makeup before the routine. During our visit there was a group of Thai dancers, beautifully dressed in glittering gold traditional costumes with tall head pieces. The choreography was rather gentle but more fascinating seemed to be the long time it took for a new troupe to apply their makeup. It was very humid that day and as well as the heat we were also suffering the effects of jet lag after the long flight from London the day before. The Erawan Shrine was a peaceful stop. 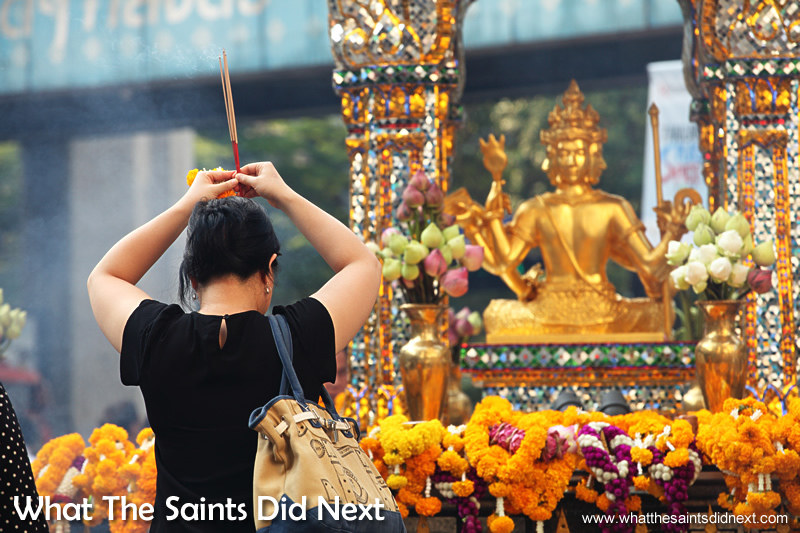 Even though it was crowded with worshippers and the busy road intersection just outside was buzzing with the noise of tuk tuks and taxis, an atmosphere of calm prevailed inside the shrine. The Erawan Shrine, is a Hindu shrine in Bangkok, Thailand. 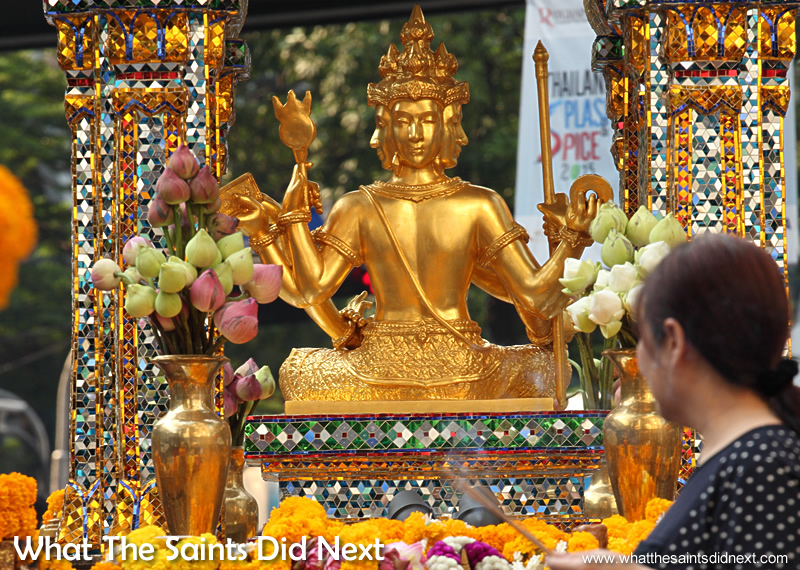 Sitting in the centre is the gold statue of Phra Phrom, the Thai representation of the Hindu god of creation Lord Brahma. Phra Phrom is sometimes referred to as the four faced Buddha. The name Erawan is Thai for Airavata, the mythical white elephant who carries the Hindu god, Indra. 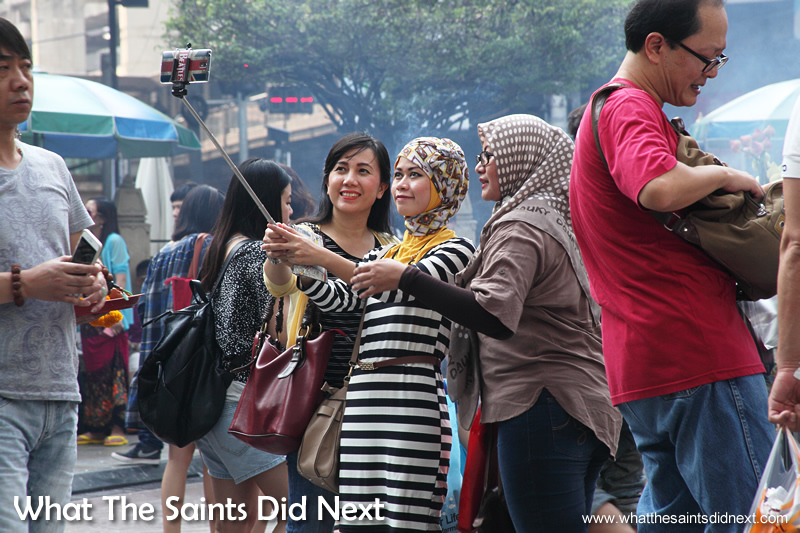 Three young friends pose for a selfie at the Erawan Shrine, Bangkok. 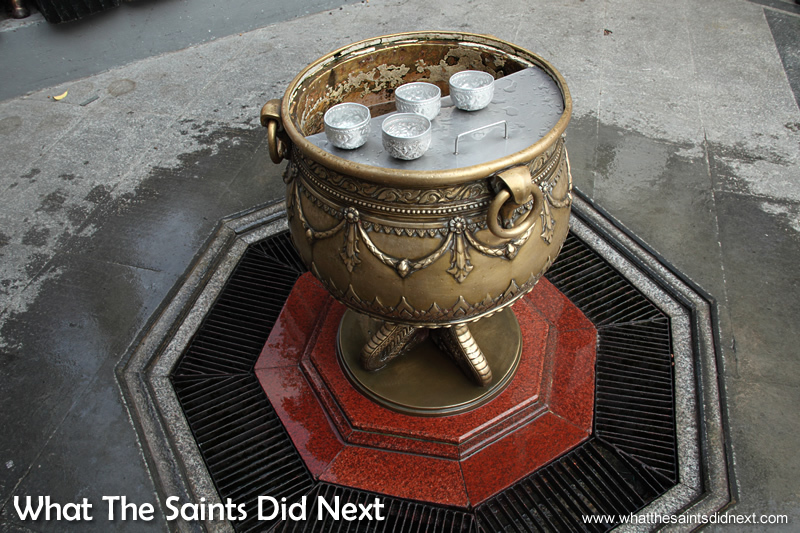 Water font at the Erawan Shrine where worshippers wash their hands after (and sometimes before) prayers. The Erawan Shrine was built in 1956 as part of the government-owned Erawan Hotel (hotel since demolished) to eliminate the bad karma believed caused by laying the foundations on the wrong date. 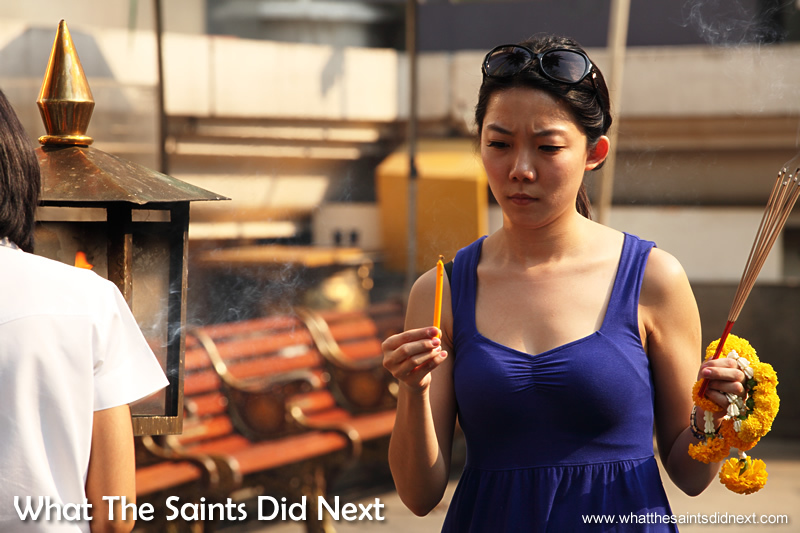 Note the ever present smoke rising from incense and candles causing a blueish haze to hang over the shrine. The name Erawan is Thai for Airavata, the mythical white elephant who carries the Hindu god, Indra. There is a spectacular Erawan Museum on the outer reaches of Bangkok, in the shape of a 29 metre high elephant with a temple located inside its belly. Click here to view our visit. The bombing at the Erawan Shrine on 17 August, 2015, killed 20 people and injured more than 100 others. 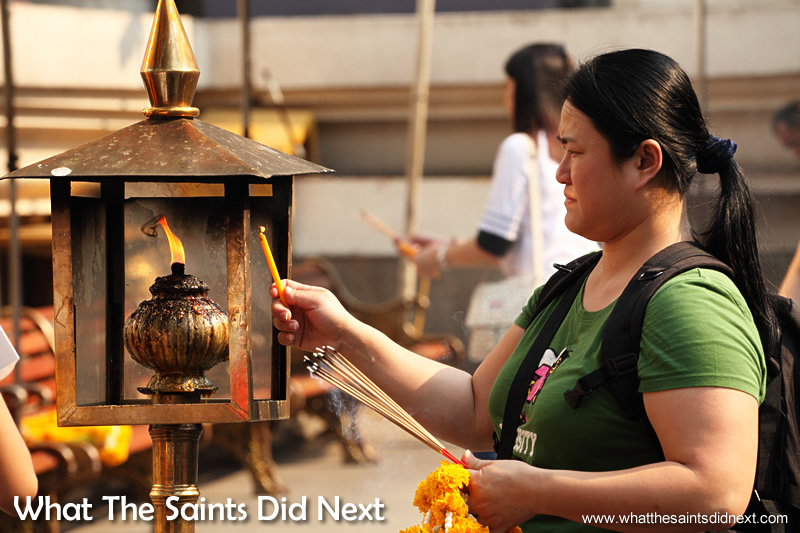 It was a cowardly act and I hope it doesn’t have too negative an impact on the spirit of Bangkok. It’s a city pulsating from more than eight million people who bring so much character to the colourful streets. There’s plenty of freedom for visitors to move around, browse the markets that squeeze onto the narrow pavements, wander through the sprawling streets and marvel at the choking streams of seemingly endless traffic. Visiting Bangkok for us was an unforgettable experience and part of it was that peaceful afternoon at the Erawan Shrine observing an important part of Thai culture. Nothing’s changed our hope to return before too long and discover more of this amazing city. 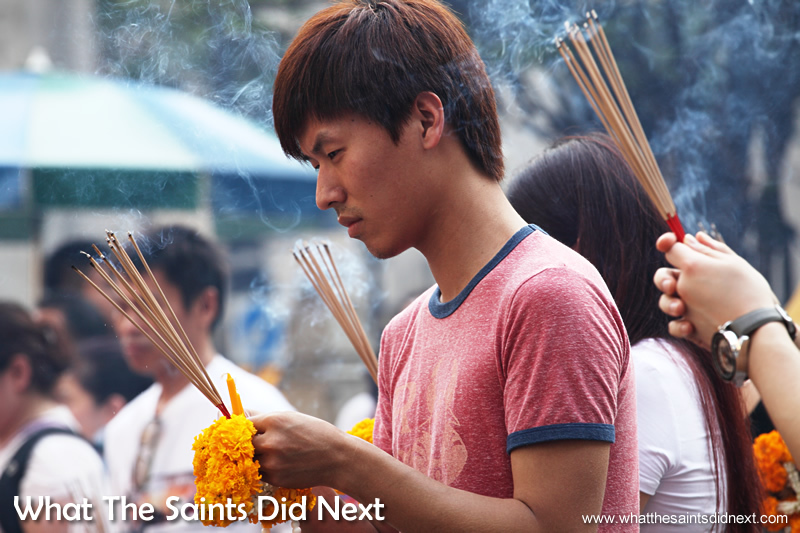 A worshipper at the Erawan Shrine in Bangkok, Thailand, burning incense before the gold statue of the Buddha, Phra Phrom. 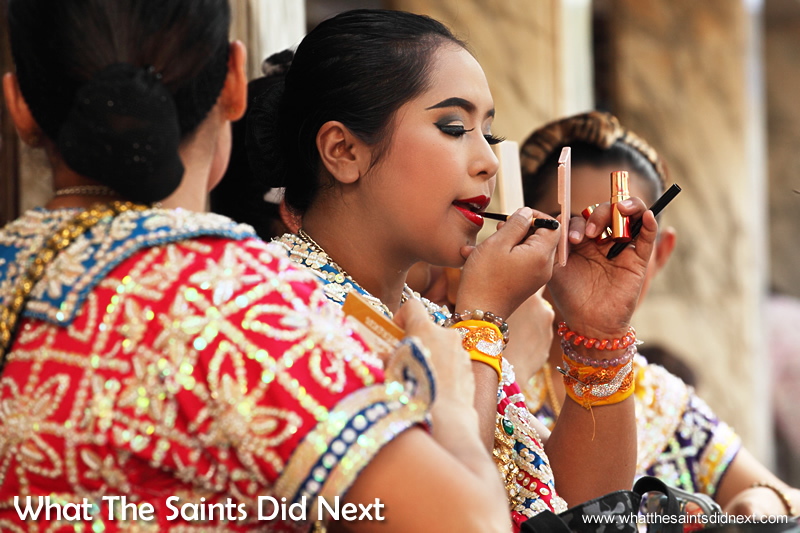 Click here for more of our photo blog posts from Thailand.